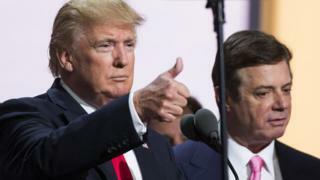 US prosecutors have accused Donald Trump's former campaign manager Paul Manafort of trying to tamper with potential witnesses ahead of his trial. Mr Trump denies any collusion and has consistently spoken of Mr Mueller's investigation as a political "witch hunt". Mr Manafort's first trial, on charges of money laundering and illegal lobbying, is due to begin in September. Who is Manafort accused of contacting? According to Mr Mueller's motion, Mr Manafort tried to reach witnesses who could be called to testify about unlawful lobbying that he allegedly carried out on behalf of Ukraine's previous pro-Russian government. He is said to have made tens of millions of dollars from a campaign to bolster that government's reputation within Europe and the US, but not to have registered this work. Prosecutors provided the judge with a summary of contacts they said were made with potential witnesses between February and April this year using encrypted text messaging apps. The communications were an "effort to influence their testimony and to otherwise conceal evidence", FBI Special Agent Brock Domin wrote in a separate declaration filed to the court. Could Manafort go to jail? Mr Mueller has asked the judge to consider such a move, or at least revise the terms of the release. Mr Manafort, who resigned as chairman of the Trump campaign in August 2016, has been under house arrest since he was charged last October. His reaction to the new allegations of witness tampering was not immediately known. His other trial - on tax fraud charges - is due to start next month. How is Mueller's main inquiry progressing? The special counsel is investigating whether there was any collusion between Russia and Mr Trump's campaign, and whether the president unlawfully tried to obstruct the inquiry after the election. Mr Mueller was appointed after Mr Trump fired FBI director James Comey last May. Sixteen Russian individuals and firms have been indicted for alleged meddling in the election. Former Trump campaign and administration staff indicted by Mr Mueller also include Michael Flynn, the president's former national security adviser; Rick Gates, a former deputy campaign chair; and George Papadopoulos, a former foreign policy adviser. Like Mr Manafort, they are not accused of colluding with Russia. Unlike him, they have worked out plea deals with prosecutors and are co-operating with the main inquiry. It remains unclear whether Mr Mueller will ask the president to testify. In the latest development, Mr Trump tweeted on Monday that he had the "absolute right" to pardon himself in the Russia inquiry, while insisting he had done nothing wrong. Constitutional scholars are divided on whether a president can pardon himself, as none have ever tried. What else is happening in Mueller probe? The White House has changed its story about a meeting, which is thought to be central to the inquiry, at Trump Tower in June 2016 between Trump campaign officials and Russians. Mr Manafort and Donald Trump Jr were among those present at the discussion with a Kremlin-linked lawyer who promised the president's son political dirt on Hillary Clinton. The White House has repeatedly denied the president dictated a misleading statement by his son, which claimed the meeting was about Russian adoption policy. But in a memo this January to the Mueller team, first reported on Saturday by the New York Times, the White House reversed that position. "The president dictated a short but accurate response… on behalf of his son, Donald Trump, Jr," the White House acknowledged in a private letter to investigators. The confidential note to Mr Mueller came despite numerous denials over the past year that he had "dictated" the statement. On Monday, Trump spokeswoman Sarah Sanders declined to explain the discrepancy. The president's lawyer, Rudy Giuliani, told CNN: "It was a mistake. I swear to God, it was a mistake."